Necrosis (from the Greek νέκρωσις "death, the stage of dying, the act of killing" from νεκρός "dead") is a form of cell injury which results in the premature death of cells in living tissue by autolysis. Cellular death due to necrosis does not follow the apoptotic signal transduction pathway, but rather various receptors are activated, and result in the loss of cell membrane integrity and an uncontrolled release of products of cell death into the extracellular space. This initiates in the surrounding tissue an inflammatory response which attracts leukocytes and nearby phagocytes which eliminate the dead cells by phagocytosis. However, microbial damaging substances released by leukocytes would create collateral damage to surrounding tissues. This excess collateral damage inhibits the healing process. Thus, untreated necrosis results in a build-up of decomposing dead tissue and cell debris at or near the site of the cell death. A classic example is gangrene. For this reason, it is often necessary to remove necrotic tissue surgically, a procedure known as debridement. 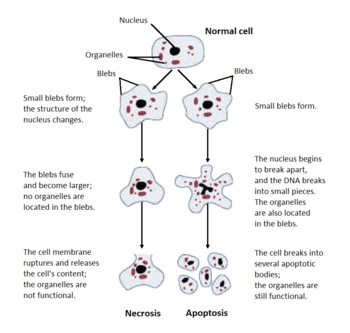 Structural signs that indicate irreversible cell injury and the progression of necrosis include dense clumping and progressive disruption of genetic material, and disruption to membranes of cells and organelles. Coagulative necrosis is characterized by the formation of a gelatinous (gel-like) substance in dead tissues in which the architecture of the tissue is maintained, and can be observed by light microscopy. Coagulation occurs as a result of protein denaturation, causing albumin to transform into a firm and opaque state. This pattern of necrosis is typically seen in hypoxic (low-oxygen) environments, such as infarction. Coagulative necrosis occurs primarily in tissues such as the kidney, heart and adrenal glands. Severe ischemia most commonly causes necrosis of this form. Liquefactive necrosis (or colliquative necrosis), in contrast to coagulative necrosis, is characterized by the digestion of dead cells to form a viscous liquid mass. This is typical of bacterial, or sometimes fungal, infections because of their ability to stimulate an inflammatory response. The necrotic liquid mass is frequently creamy yellow due to the presence of dead leukocytes and is commonly known as pus. Hypoxic infarcts in the brain presents as this type of necrosis, because the brain contains little connective tissue but high amounts of digestive enzymes and lipids, and cells therefore can be readily digested by their own enzymes. Caseous necrosis can be considered a combination of coagulative and liquefactive necrosis, typically caused by mycobacteria (e.g. tuberculosis), fungi and some foreign substances. The necrotic tissue appears as white and friable, like clumped cheese. Dead cells disintegrate but are not completely digested, leaving granular particles. Microscopic examination shows amorphous granular debris enclosed within a distinctive inflammatory border. Granuloma has this characteristic. Fat necrosis is specialized necrosis of fat tissue, resulting from the action of activated lipases on fatty tissues such as the pancreas. In the pancreas it leads to acute pancreatitis, a condition where the pancreatic enzymes leak out into the peritoneal cavity, and liquefy the membrane by splitting the triglyceride esters into fatty acids through fat saponification. Calcium, magnesium or sodium may bind to these lesions to produce a chalky-white substance. The calcium deposits are microscopically distinctive and may be large enough to be visible on radiographic examinations. To the naked eye, calcium deposits appear as gritty white flecks. Fibrinoid necrosis is a special form of necrosis usually caused by immune-mediated vascular damage. It is marked by complexes of antigen and antibodies, sometimes referred to as "immune complexes" deposited within arterial walls together with fibrin. In blind mole rats (genus Spalax), the process of necrosis replaces the role of the systematic apoptosis normally used in many organisms. Low oxygen conditions, such as those common in blind mole rats' burrows, usually cause cells to undergo apoptosis. In adaptation to higher tendency of cell death, blind mole rats evolved a mutation in the tumor suppressor protein p53 (which is also used in humans) to prevent cells from undergoing apoptosis. Human cancer patients have similar mutations, and blind mole rats were thought to be more susceptible to cancer because their cells cannot undergo apoptosis. However, after a specific amount of time (within 3 days according to a study conducted at the University of Rochester), the cells in blind mole rats release interferon-beta (which the immune system normally uses to counter viruses) in response to over-proliferation of cells caused by the suppression of apoptosis. In this case, the interferon-beta triggers cells to undergo necrosis, and this mechanism also kills cancer cells in blind mole rats. Because of tumor suppression mechanisms such as this, blind mole rats and other spalacids are resistant to cancer. External factors may involve mechanical trauma (physical damage to the body which causes cellular breakdown), damage to blood vessels (which may disrupt blood supply to associated tissue), and ischemia. Thermal effects (extremely high or low temperature) can result in necrosis due to the disruption of cells. In frostbite, crystals form, increasing the pressure of remaining tissue and fluid causing the cells to burst. Under extreme conditions tissues and cells die through an unregulated process of destruction of membranes and cytosol. Internal factors causing necrosis include: [ http://www.merriam-webster.com/medical/trophoneurosis trophoneurotic] disorders; injury and paralysis of nerve cells. Pancreatic enzymes (lipases) are the major cause of fat necrosis. Necrosis can be activated by components of the immune system, such as the complement system; bacterial toxins; activated natural killer cells; and peritoneal macrophages. Pathogen-induced necrosis programs in cells with immunological barriers (intestinal mucosa) may alleviate invasion of pathogens through surfaces affected by inflammation. Toxins and pathogens may cause necrosis; toxins such as snake venoms may inhibit enzymes and cause cell death. Necrotic wounds have also resulted from the stings of Vespa mandarinia. Pathological conditions are characterized by inadequate secretion of cytokines. Nitric oxide (NO) and reactive oxygen species (ROS) are also accompanied by intense necrotic death of cells. A classic example of a necrotic condition is ischemia which leads to a drastic depletion of oxygen, glucose, and other trophic factors and induces massive necrotic death of endothelial cells and non-proliferating cells of surrounding tissues (neurons, cardiomyocytes, renal cells, etc.). Recent cytological data indicates that necrotic death occurs not only during pathological events but it is also a component of some physiological process. Activation-induced death of primary T-lymphocytes and other important constituents of the immune response are caspase-independent and necrotic by morphology; hence, current researchers have demonstrated that the occurrence of necrotic cell death can not only occur during pathological processe, but also during normal processes such as tissue renewal, embryogenesis, and immune response. Until recently, necrosis was thought to be an unregulated process. There are two broad pathways in which necrosis may occur in an organism. The first of these two pathways initially involves oncosis, where swelling of the cells occur. The cell then proceeds to blebbing, and this is followed by pyknosis, in which nuclear shrinkage transpires. In the final step of this pathway the nucleus is dissolved into the cytoplasm, which is referred to as karyolysis. The second pathway is a secondary form of necrosis that is shown to occur after apoptosis and budding. Cellular changes of necrosis occur in this secondary form of apoptosis, where the nucleus breaks into fragments, which is known as karyorrhexis. Karyolysis: the chromatin of the nucleus fades due to the loss of the DNA by degradation. Pyknosis: the nucleus shrinks and the chromatin condenses. Karyorrhexis: the shrunken nucleus fragments to complete dispersal. Plasma alterations are also seen in necrosis. Plasma membranes appear discontinuous when viewed with an electron microscope. This discontinuous membrane is caused by cell blebbing and the loss of microvilli. Debridement, referring to the removal of dead tissue by surgical or non-surgical means, is the standard therapy for necrosis. Depending on the severity of the necrosis, this may range from removal of small patches of skin to complete amputation of affected limbs or organs. Chemical removal of necrotic tissue is another option in which enzymatic debriding agents, categorised as proteolytic, fibrinolytic or collagenases, are used to target the various components of dead tissue. In select cases, special maggot therapy using Lucilia sericata larvae has been employed to remove necrotic tissue and infection. In the case of ischemia, which includes myocardial infarction, the restriction of blood supply to tissues causes hypoxia and the creation of reactive oxygen species (ROS) that react with, and damage proteins and membranes. Antioxidant treatments can be applied to scavenge the ROS. Chemical and toxic agents (e.g. pharmaceutical drugs, acids, bases) react with the skin leading to skin loss and eventually necrosis. Treatment involves identification and discontinuation of the harmful agent, followed by treatment of the wound, including prevention of infection and possibly the use of immunosuppressive therapies such as anti-inflammatory drugs or immunosuppressants. In the example of a snake bite, the use of anti-venom halts the spread of toxins whilst receiving antibiotics to impede infection. Even after the initial cause of the necrosis has been halted, the necrotic tissue will remain in the body. The body's immune response to apoptosis, which involves the automatic breaking down and recycling of cellular material, is not triggered by necrotic cell death due to the apoptotic pathway being disabled. If calcium is deficient, pectin cannot be synthesized, and therefore the cell walls cannot be bonded and thus an impediment of the meristems. This will lead to necrosis of stem and root tips and leaf edges. For example, necrosis of tissue can occur in Arabidopsis thaliana due to plant pathogens. Wikimedia Commons has media related to Necrosis. ^ a b c d e Proskuryakov SY, Konoplyannikov AG, Gabai VL (2003). "Necrosis: a specific form of programmed cell death?". Exp. Cell Res. 283 (1): 1–16. doi:10.1016/S0014-4827(02)00027-7. PMID 12565815. ^ Kasper DL, Zaleznik DF (2001). "Gas gangrene, antibiotic associated colitis, and other Clostridial infections". In Stone RM (ed.). Harrison's principles of internal medicine self-assessment and board review (15th ed.). New York: McGraw-Hill, Medical Pub. Division. pp. 922–927. ISBN 978-0071386784. ^ Rock, Kenneth (2008). "The inflammatory response to cell death". Annual Review of Pathology. 3: 99–126. doi:10.1146/annurev.pathmechdis.3.121806.151456. PMC 3094097. PMID 18039143. ^ a b c d e f g Craft J, Gordon C, Tiziani A, Huether SE, McCance KL, Brashers VL (2010). Understanding pathophysiology (1st ed.). Chatswood, N.S.W. : Elsevier Australia. ISBN 978-0729539517. ^ a b c d e f g h i j k l Kumar V, Abbas AK, Aster JC, Fausto N (2010). Robbins and Cotran pathologic basis of disease (8th ed.). Philadelphia, PA: Saunders/Elsevier. pp. 12–41. ISBN 978-1416031215. ^ a b c McConnell TH (2007). The nature of disease: pathology for the health professions. Baltimore, Mar. : Lippincott Williams & Wilkins. ISBN 978-0781753173. ^ Sattar (2015). Fundamentals of Pathology (2015th ed.). Chicago, IL: Pathoma LLC. p. 5. ISBN 978-0-9832246-2-4. ^ a b Stevens A, Lowe JS, Young B, Deakin PJ (2002). Wheater's basic histopathology: a colour atlas and text (4th ed.). Edinburgh: Churchill Livingstone. ISBN 978-0443070013. ^ Saey, Tina Hesman (5 November 2012). "Cancer cells self-destruct in blind mole rats". Science News. Society for Science and the Public. Retrieved 27 November 2012. ^ Gorbunova V, Hine C, Tian X, Ablaeva J, Gudkov AV, Nevo E, Seluanov A (2012). "Cancer resistance in the blind mole rat is mediated by concerted necrotic cell death mechanism". Proc. Natl. Acad. Sci. U.S.A. 109 (47): 19392–6. Bibcode:2012PNAS..10919392G. doi:10.1073/pnas.1217211109. PMC 3511137. PMID 23129611. ^ a b c d e f g Raffray M, Cohen GM; Cohen (1997). "Apoptosis and necrosis in toxicology: a continuum or distinct modes of cell death?". Pharmacol. Ther. 75 (3): 153–77. doi:10.1016/s0163-7258(97)00037-5. PMID 9504137. ^ Nazarian RM, Van Cott EM, Zembowicz A, Duncan LM (2009). "Warfarin-induced skin necrosis". J. Am. Acad. Dermatol. 61 (2): 325–32. doi:10.1016/j.jaad.2008.12.039. PMID 19615543. ^ Yanagawa, Youichi (10 October 1980). "Cutaneous hemorrhage or necrosis findings after Vespa mandarinia (wasp) stings may predict the occurrence of multiple organ injury: A case report and review of literature". Clinical Toxicology. 45 (7): 803–807. doi:10.1080/15563650701664871. PMID 17952752. ^ a b c d e f g Kroemer G, Galluzzi L, Vandenabeele P, Abrams J, Alnemri ES, Baehrecke EH, Blagosklonny MV, El-Deiry WS, Golstein P, Green DR, Hengartner M, Knight RA, Kumar S, Lipton SA, Malorni W, Nuñez G, Peter ME, Tschopp J, Yuan J, Piacentini M, Zhivotovsky B, Melino G, Nomenclature Committee on Cell Death 2009 (January 2009). "Classification of cell death: recommendations of the Nomenclature Committee on Cell Death 2009" (PDF). Cell Death Differ. 16 (1): 3–11. doi:10.1038/cdd.2008.150. PMC 2744427. PMID 18846107. ^ Singhal A, Reis ED, Kerstein MD (2001). "Options for nonsurgical debridement of necrotic wounds". Adv Skin Wound Care. 14 (2): 96–100, quiz 102–3. doi:10.1097/00129334-200103000-00014. PMID 11899913. ^ Horobin AJ, Shakesheff KM, Pritchard DI (2005). "Maggots and wound healing: an investigation of the effects of secretions from Lucilia sericata larvae upon the migration of human dermal fibroblasts over a fibronectin-coated surface". Wound Repair Regen. 13 (4): 422–33. doi:10.1111/j.1067-1927.2005.130410.x. PMID 16008732. ^ Eum HA, Cha YN, Lee SM (2007). "Necrosis and apoptosis: sequence of liver damage following reperfusion after 60 min ischemia in rats". Biochem. Biophys. Res. Commun. 358 (2): 500–5. doi:10.1016/j.bbrc.2007.04.153. PMID 17490613. ^ Cooper KL (2012). "Drug reaction, skin care, skin loss". Crit Care Nurse. 32 (4): 52–9. doi:10.4037/ccn2012340. PMID 22855079. ^ Chotenimitkhun R, Rojnuckarin P; Rojnuckarin (2008). "Systemic antivenom and skin necrosis after green pit viper bites". Clin Toxicol. 46 (2): 122–5. doi:10.1080/15563650701266826. PMID 18259959. ^ Edinger AL, Thompson CB; Thompson (2004). "Death by design: apoptosis, necrosis and autophagy". Curr. Opin. Cell Biol. 16 (6): 663–9. doi:10.1016/j.ceb.2004.09.011. PMID 15530778. ^ Capon B (2010). Botany for gardeners (3rd ed.). Portland, Or. : Timber Press. ISBN 978-1-60469-095-8.